The Rick Hinderer Tactical Pen is made for those who need more from their writing instrument than just the ability to write. Hinderer has used his experience and knowledge as a first responder to pioneer pens that are more than just regular office pens. This American-made blue Extreme Duty pen doubles as a self-defense tool so you always have the right tools in the field. This rugged military pen is designed and manufactured using the same precision technology as Rick Hinderer's famed tactical knives. 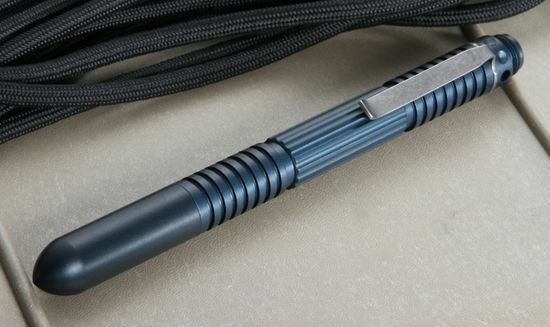 The casing is made of aircraft grade aluminum and has a military grade anodized blue finish that gives it the durability needed for diving, firefighting or close quarters combat. Traction grooves are placed to give you a solid grip whether you're writing down coordinates or warding off attackers. 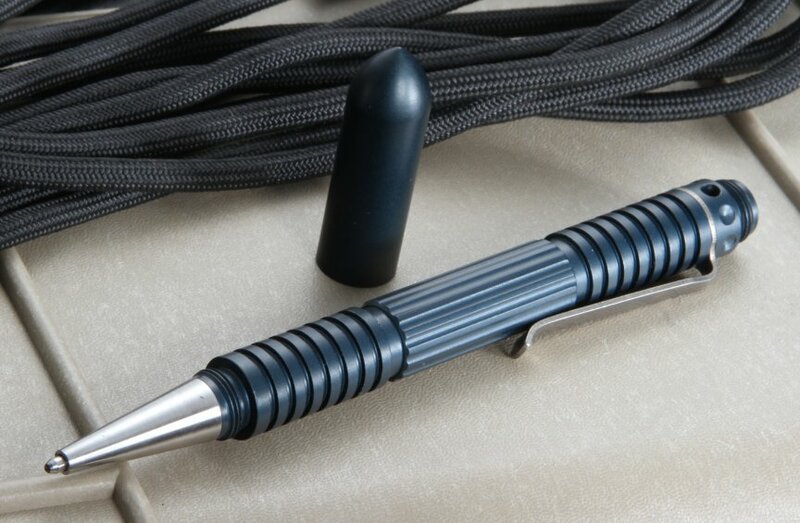 The nib is made of 17-4PH stainless steel, making this pen tough from head to toe. Hinderer Extreme Duty pens built using coarse threads on each component. The added thread height gives them additional strength that is needed when using them as a combat tool. They also have a modular design, meaning users can attach a variety of accessories such as AP points, bezels and pocket clips to meet mission-critical needs. When your pen runs dry, you can easily add a Fisher Space Pen refill to restore ink levels. 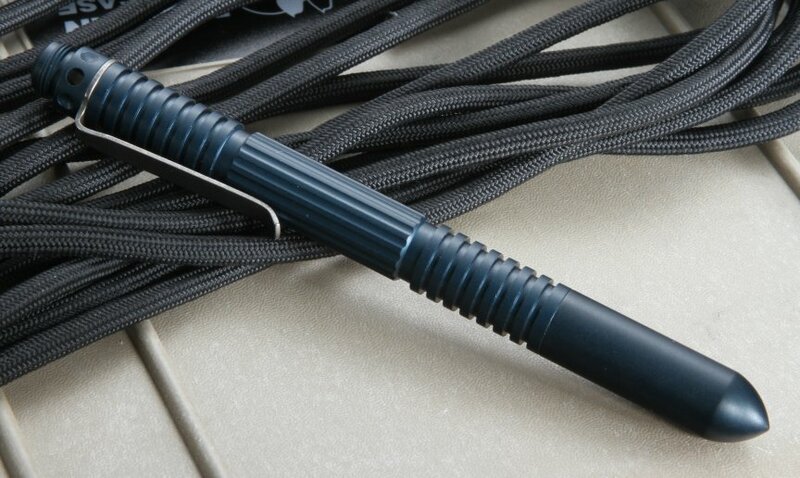 This aluminum blue tactical pen is an essential tool for military personnel and those who need an added level of personal protection. 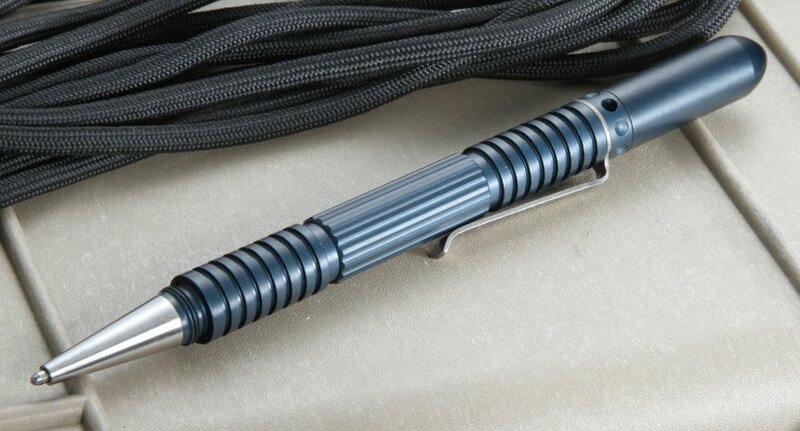 KnifeArt.com has fast shipping on these extreme outdoor pens with prompt service from our knowledgeable staff. Each one has a limited lifetime manufacturer's warranty. Overall Length with Cap: 5.5"
I love the Pen, I had another brand before and like this one much better. The serrations provide a good grip, it is very light and the blunt end will not wear a hole in your pocket.